Today is (normally) a light-volume (pre) holiday session, and traditionally, such days are often bullish. The simple reason for this is because the large institutions know they can't sell much into a light volume day, because they're liable to tank whatever issues they're selling, so these types of sessions tend to be bullish essentially by default. 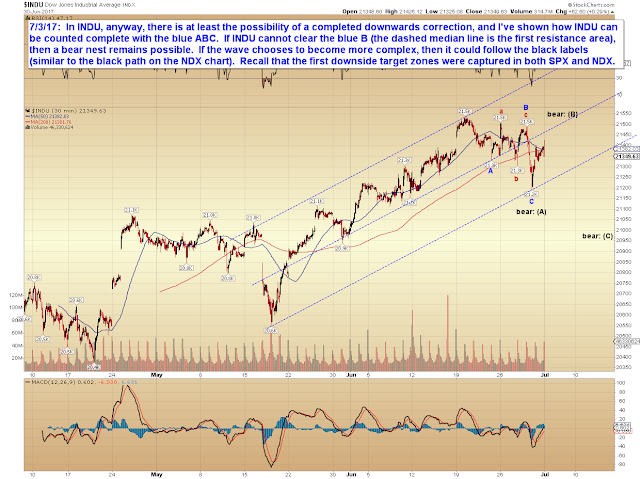 INDU is also not nearly as far below its ATH as NDX (or SPX for that matter), so it's certainly possible that INDU will rally over its ATH to complete a fifth wave while NDX corrects in a large expanded flat. First things first, of course, and both INDU and NDX need to clear the peaks of their prior swing highs before bulls can get too excited. 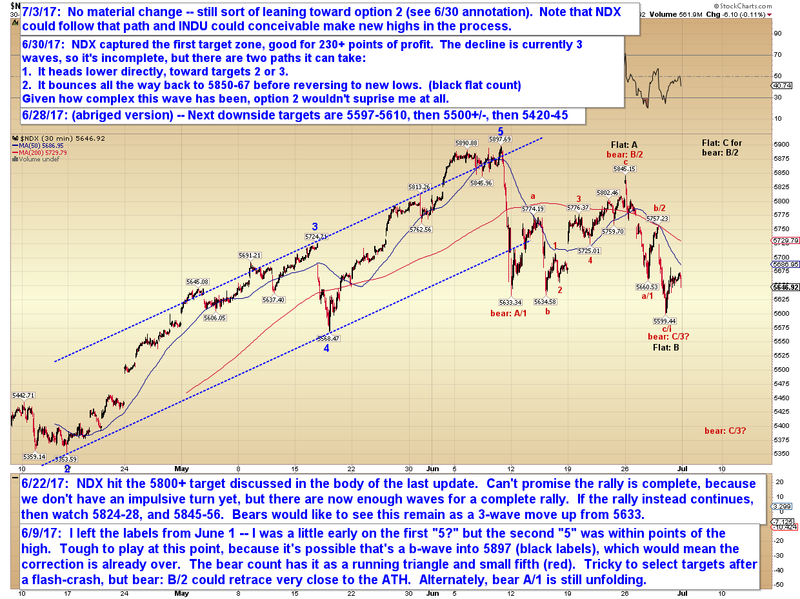 But that shouldn't matter much to bears, as NDX and SPX both captured their first downside target zones for nice profits, so there's no need to push questionable patterns at the moment -- one can afford patience (and one's account often CANNOT afford impatience), and get back in when things look clean again. In conclusion, I think one of the things leaning me toward the expanded flat in NDX is the fact that if that's a bear nest instead of an abc decline, then it's quite bearish -- maybe too bearish? One other possibility that I haven't discussed it that of an ending diagonal C wave, wherein the black "Flat: B" label would be wave i of said diagonal, with the current rally being ii -- in that event, NDX would head lower fairly directly, but not massively lower. We'll burn that bridge if and when we come to it, though. As I mentioned last update, an expanded flat isn't really "predictable" ahead of time, but for now (anyway), my instinct, at least, is for the black expanded flat, which would mean we continue to rally for the near-term. If we pull a steep downward reversal in the coming sessions and form a bearish daily candle, then my instinct is probably incorrect. I hope everyone has a happy fourth of July -- trade, and be, safe.